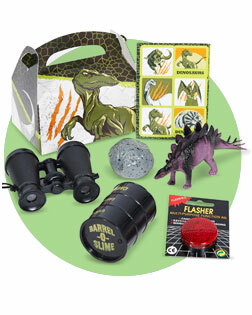 They'll be ready to stomp around at your next fun birthday party or any other event with these fun and handy Dinosaur Adventure Party Supplies! Get tableware like dessert plates, napkins, and colorful utensils, big decorative balloons, pinatas, and table covers, and even favors like stampers, excavation kits, and personalized candy bars, all bearing huge, ferocious beasts from long ago! Dinosaurs roamed the planet for millions of years. Most believe they went extinct, but you have special knowledge proving that dinosaurs are alive and well in your child’s imagination. In your house, not a day goes by without T-Rex chasing down a velociraptor or doing battle with a triceratops. At BirthdayExpress, we know how crazy kids are about dinosaurs. 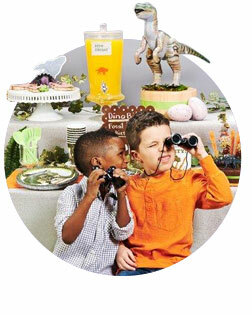 We have a variety of dinosaur themes to match your child’s age and interest, including Jurassic World, Dinosaur Train and Little Dino—everything you’ll need to throw the ultimate dinosaur-themed birthday party! There are endless ways to personalize your dinosaur-themed party. A popular way of doing this is to turn your kid’s favorite food into a prehistoric-themed meal! For example, hamburgers can become Pterodactyl burgers. Let your creativity carry you away! Are you ready to turn your house into a dinosaur-filled jungle? To make your kid’s party memorable, check out our blog for ideas to make every detail of your party positively prehistoric. 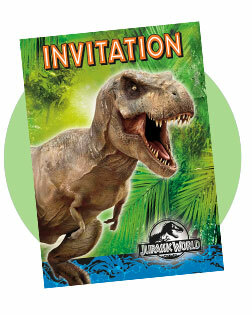 Start spreading the word with these dinosaur-themed invitations. Parents will be able to plan their schedules around the event, and your kid’s friends will be excited to get back to the world of the dinosaurs and celebrate the big day. We have a variety of dinosaur themes to match your child’s age and interest, including Jurassic World, Dinosaur Train and Little Dino. Preparing for a party can get a little overwhelming. There are a thousand details to plan, especially if it involves transforming your house into a Jurassic paradise for a pack of mini dinosaurs! At times, it might feel like you’ve been forced to dig up the fossilized remains to get things right. At BirthdayExpress, we have a variety of decorations to give your party that personalized touch. And we have the right kind of dinosaur theme to match your kid’s age and interests. Even with sharp claws and teeth gnashing around your house, you’ll definitely want balloons at your party. Our dinosaur balloon bouquet includes two illustrated foil balloons and a variety of other styles and colors that will bring extra flair to the party. These balloons are available in Jurassic World, Dino Train or Little Dino styles. Whether you choose dinosaurs, Little Dino, Dinosaur Train or Jurassic World, this banner will make your kid’s birthday extra special with a personalized message from his favorite reptile! Select the font and color, write the message, and our high-definition printer will produce a customized banner to make your kid’s big day impossible to forget. They’ve torn through jungles, roamed the plains and devoured whatever they could sink their teeth into. Now, the voracious descendants of the dinosaurs are coming to your table. Never worry! While their hunger for cake and all things dinosaur might seem endless, our tableware will keep them entertained with fun images of their favorite prehistoric lizards. Best of all, our disposable party tableware is convenient! It comes in a variety of styles to suit your kid’s age and interests so all the kids will be entertained and you won’t have to stay up all night doing dishes! Millions of years after they vanished from the earth, your house is full of little dinosaurs. Now you have to keep them entertained so they don’t break out of the yard and run amok through the neighborhood. What will you do with such ferocious, adorable prehistoric beasts? Let us help. With years of hearing form moms and dads, we’ve come up with some great ideas for activities that will keep everyone smiling and make your kid’s birthday a party to remember! What did dinosaurs eat? Candy! If your kids don’t believe this, maybe they will once they see what comes out of our dinosaur piñata. From the classic dinosaur to Little Dino We have a variety of dinosaur-themed piñatas to fit your kid’s party. Up, up and away! These gliders are easy to assemble and huge fun to play with. With realistic images of dinosaurs on the body and the wings, your kid will want to hang onto long these gliders after the party is over! Our vinyl wall decal is an easy way to transform an ordinary wall into an extraordinary prehistoric scene. Simply peel and stick. Once the party is over, this reusable decal can be moved into your kid’s room, serving as a reminder of their special party. Does your kid eat and breathe all things dinosaur? With this dino costume, it’ll be easy for them to take that next step and become a dinosaur! They’ll think they’re terrifying, and you’ll think they’re adorable! Available in triceratops and tyrannosaurus varieties. With all the planning you’ve been doing, there’s no doubt the party will be a success of Jurassic proportions. When you see the smile on your little one’s face you’ll be sure to want to thank all their friends for coming over and making this day so special. There’s no easier way to do this than to send them home with one of our Favor Boxes. This will make your party even more unforgettable and make them eager to celebrate the next one! This Favor Box comes with everything your guests will need to start their next dinosaur adventure. Complete with a cool toy dinosaur, flashing light, binoculars and even a barrel of slime. The perfect way to keep a creative child busy! 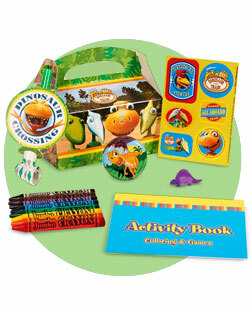 Easy to assemble, our Dinosaur Train Favor Box includes crayons and activity book, along with a party favor, yo-yo and a grow-your-own-dinosaur toy!